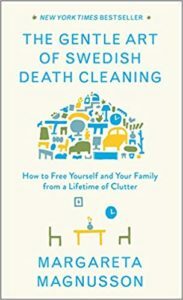 Okay, don't freak by the title ... yes, it is about how to clear your clutter before you die. Recommended in The Little Book of Hygge (see blog from 12/24/2018), it is another little book about wisdom from the Swedes. Magnusson writes about sorting through your things, so someone else doesn't have the burden of it. She recommends you begin when you are 65, knowing it will take a few years to get it done. This short sweet book also provides you with hints and perspectives if you are downsizing or simply wanting to de-clutter. I was attracted to this book in part because of Hygge, but also because I reached a time when I was finally ready to clean Beryl’s office, 2.5 years after he died. This task eluded me and seemed insurmountable. I invited a friend over and accomplished it in an afternoon, for which I am glad. Read this book if it grabs your fancy. You’ll read it in a day, and perhaps clean out one thing from your home. I would love for Ned to read this book (he won’t). He is waaay behind on cleaning out his stuff. Still has a computer (with monitor) in the garage that runs on MS-DOS. Having helped cleaned out my parents home (more than once), I am aware what a task this is so try to stay on top of my accumulating stuff. One of my favorite jobs at the library was the seemingly mundane task of weeding the collection. Actually, it was an important and challenging job to manage the depth and breath of the collection in a limited space. Just like all the stuff in our lives. I found most valuable the ways she suggests dividing the tasks … doing all like items together. You’ll see!